A hospital foundation from the Middle Ages, the Hospices de Beaune is one of France’s most prestigious historic monuments. When in 1443, Chancellor Nicolas Rolin founded the Hôtel Dieu (Hospices de Beaune), Beaune was coming out of the 100 years war, a period of unrest and plague that decimated the countryside. It was for the poor and the most disadvantaged that this masterpiece inspired by the most outstanding hôtels-Dieu of Flanders and Paris was built. Behind the austere slate roofs of the facade are the stunning courtyard, beautiful varnished tile roofs and overhead skylights. All around the courtyard, the harmonious organisation of buildings rule the life of this charitable institution: under the hull-shaped arches of the poor room, the sick were welcomed in, and in the kitchen with its huge Gothic chimneys, meals were prepared, while the apothecary with its mortar and earthenware pots, was the preserve of the sister pharmacist. Nicolas Rolin used his vast knowledge of hospital institutions to make his hôtel Dieu (Hospices de Beaune) an establishment capable of surviving the centuries. As a good trader, he placed it under the spiritual authority of the Holy See, free from any charge and under good management, endowing it with vineyards, farms and woods. But the search for architectural perfection, the beauty of objects and the polyptych of the Last Judgement ordered from Rogier Van der Weyden, one of the great masters of Flemish painting, it’s the Christian and philanthropist to whom we’re indebted. Nicolas Rolin made his hôtel dieu a work and an act of faith for all eternity. In 1457, Guillemette Levernier made the first gift of vineyards to the Hospices de Beaune, and this tradition was to continue for five centuries. Today, the wine estate is around 60 hectares, of which 50 are devoted to Pinot Noir and the rest to Chardonnay. Entrusted to 22 winemakers handpicked by its manager, this exceptional vineyard accounts for 85% of premiers crus and grands crus sold at auction on the third Sunday in November. The sale, today organised by Christie's auction house, is the most famous wine charity auction in the world. The proceeds of the sale are used to improve the hospital’s equipment and in the conservation of the Hôtel Dieu. In 1966, Gérard Oury shot the film “La Grande Vadrouille” (literally "The Great Stroll") within the Hôtel Dieu (Hospices de Beaune). The cult scenes with Bourvil and Louis de Funès revolve around the courtyard, the great hall of the poor, while a pilot from the Royal Air Force, the famous Big Moustache, is "extracted" in extremis from the hospital, bottle in hand! This film, the greatest success of French cinema in the 20th century, continues to guarantee, more than 60 years later, the popularity of the Hôtel Dieu (Hospices de Beaune). 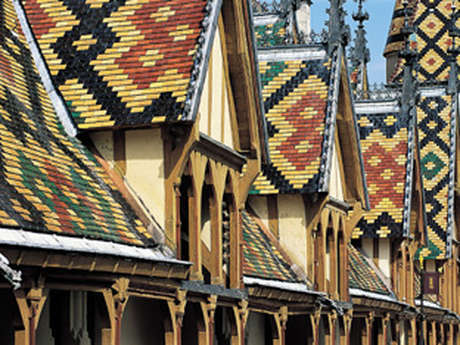 The polychrome roofs are inextricably linked to Burgundy.